The so-called dead zone in the Gulf of Mexico — a region of oxygen-depleted water off the Louisiana and Texas coasts that is harmful to sea life — is predicted to be the largest ever recorded when it develops later this summer, scientists report. The unusually large size of the zone is due to the extreme flooding of the Mississippi River this spring, which equaled or surpassed the historic floods of 1927 and 1937, according to the National Weather Service. 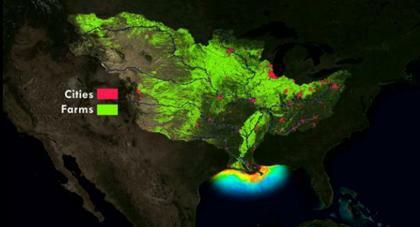 The dead zone occurs at the bottom of the Gulf when there is not enough oxygen in the water to support marine life. Also known as hypoxia, it is created by nutrient runoff, mostly from over-application of fertilizer on agricultural fields. According to the National Oceanic and Atmospheric Administration (NOAA), which oversees the dead zone research, 41% of the contiguous USA drains into the Mississippi River and then out to the Gulf of Mexico. The majority of the land in the Mississippi’s watershed is farmland. Excess nutrients such as nitrogen can spur the growth of algae, and when the algae die, their decay consumes oxygen faster than it can be brought down from the surface, NOAA says. As a result, fish, shrimp and crabs can suffocate. The entire depth of the Gulf is not a dead zone, only the bottom two meters, says Steve DiMarco, an associate professor of oceanography at Texas A&M. What happens to the sea life in that dead zone? Don Scavia, a professor of natural resources at the University of Michigan, says that most anything that can swim away leaves, but that anything that can’t leave, such as the bottom-dwelling bugs that fish and shrimp feed on, will die. "The dead zone is an annual event," he says. The problem repairs itself by fall but, meanwhile, affects commercial fisheries. In a typical year, Scavia says the dead zone extends from the Mississippi Delta to the Texas-Louisiana border. This one will likely extend farther to the west than those in previous years, he reports. Scientists say the area could measure between 8,500 and 9,421 square miles, or an area about the size of New Hampshire. If it does reach those that size, it will be the largest since mapping of the Gulf dead zone began in 1985. Eugene Turner, a professor of oceanography and coastal sciences at Louisiana State University, says the dead zone tends to peak in July, when winds and waves are quite low in the Gulf. The dead zone has been identified each year since 1985, although the problem seems to have started in the late 1950s, adds DiMarco. It usually fades away in September and October as waves and winds increase, Turner says.